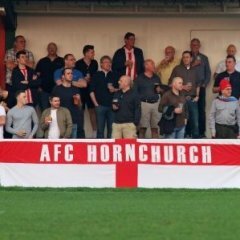 The OFFICIAL HISTORY OF AFC HORNCHURCH will be published in July and will cover the seasons when we were known as AFC Hornchurch, from 2005-06 to the end of the current season 2018-19. It will be at least 200 pages, and will include a detailed summary of every season, player profiles and photos, line ups and appearances, written contributions from Colin McBride, Jim McFarlane, Mark Stimson, John Lawrence, Alex Sharp, Elliot Styles, George Purcell and the Supporters Association. If anyone wants to subscribe in advance, please speak to Fred Hawthorn in the club shop. For a payment of £12 your name will appear as one of the subscribers and you will receive the book free of charge when it is published in July. ALL PROCEEDS GO TOWARDS THE PROJECT URCHIN FUND. Oh go on then, stick me down please Tony. And one for Joe Trotter please. Thanks - Jago and Joe Trotter now added. Jean and Pete Burd added. One for me please. Put my name as Pete Parish. one for Wally Dowler please. one for me too please Tony. Put me down for one please Tony. Thanks - now added to list. Thanks, Gavin - now added to list. The list is growing nicely. Can everyone check the spelling of their names please, just in case I have got any of them wrong. Copy for me please (Anthony Whitaker). Thanks! Thanks - added to list. A copy too for Laurence Pickering please, thanks. Thanks - Laurence added to list. Anthony can you confirm - is it Laurence or Lawrence?